'Trailer Park Boys' Bubbles Actor Mike Smith Arrested In L.A.
"At no time did I assault her." Canadian actor Mike Smith — best known for his role in "Trailer Park Boys" — has issued a statement, disputing his arrest for allegedly choking a woman in Los Angeles. 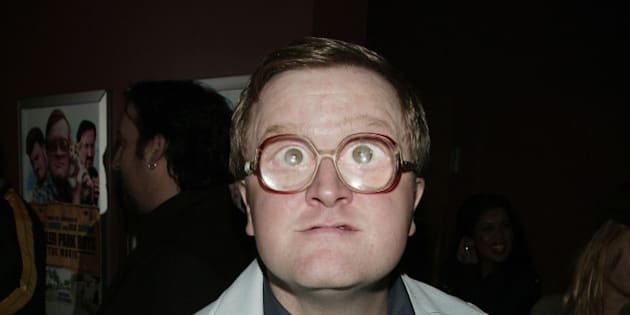 Smith, who plays Bubbles in the Netflix series shot in Nova Scotia, was charged with misdemeanor domestic battery after an incident at Hollywood's Roosevelt Hotel on Friday, reported TMZ. Witnesses told the celebrity news site they heard an argument in the bathroom and a woman yell "You're choking me." They claimed to have found the 43-year-old actor pinning her against the wall. "At no time did I assault her. I am not guilty of the misdemeanour charged against me." On Saturday, Smith released a public statement through the "Trailer Park Boys" — along with the alleged victim, Georgia Ling. "At no time did I assault her. I am not guilty of the misdemeanour charged against me," Smith said, describing Ling as "a friend." In the statement, Ling confirms that the two did have a heated dispute, but said, "At no point did I feel I was in danger, otherwise I would've called the police myself, which I did not." The LAPD Sheriff’s Department database shows that Smith was arrested early Friday at 1 a.m. He was released on US$20,000 bail about four hours later. Those who overheard the argument say it seemed to be sparked by text messages Smith was sending, added the New York Daily News. Other cast members and staff of "Trailer Park Boys" support Smith, said Saturday's statement from the show. However, later that day, castmate Lucy DeCoutere announced via Twitter that she has resigned from the show due to Smith's arrest and charge. She said she had spoken to both Smith and Ling. "Trailer Park Boys," which follows residents in the fictional Sunnyvale Trailer Park set in the Maritime province, has developed a cult following. Smith's character Bubbles is known for his foul-mouthed quips and ultra-magnifying, round glasses. The franchise has spawned several films, and a TV series which originally ran from 2001 to 2008 and was later picked up by Netflix for a reboot in 2014. What's Good on Netflix Canada in April 2016?